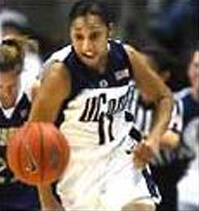 Ketia Swanier was a Guard for the UConn Huskies from 2004 – 2008. As a senior at UConn she earned the Big East Sixth Man of the Year Award and was the only UConn player in program history to rank among the top ten career leaders in games played (142), assists (479), and steals (247). Ketia was the twelfth overall draft pick in the Women’s National Basketball Association (WNBA) Draft in 2008 to the Connecticut Sun. “As a kid I played several sports/activities, but there was something about basketball. I just loved it.” Ketia played on her first team when she was in third grade, but soon moved to Germany (her parents were both in the U.S. Army and were stationed in Germany). She became serious with her basketball interest when she was 11, and played on her first Amateur Athletic Union (AAU) team. Ketia’s best memories from playing basketball as a youngster are the friends she made. By the time she reached high school she was back in the United States and settled in Georgia. Being so far from the friends she made in Germany, she’s happy to say she has stayed in contact with many of them even though they all went their separate ways. Ketia credits the opportunity as a freshman at Columbus High School, Columbus, Georgia, as the turning point of her basketball future. “Playing against a couple of players who were really good at a young age (freshman) made me realize I had a little bit of game to me, and that basketball could be a part of my future.” While in high school Ketia earned many honors; three-time Georgia AAAA All-State First Team, four-time Metro Player of the Year, and her senior year she was Georgia AAAA Player of the Year. “The college recruiting process was a growing and learning experience.” When Ketia came to UConn for her visit she liked the environment. The people she met were great, and she had a good feeling about it. “It was one of those gut instincts. I loved it, so I chose UConn.” Although she enjoyed the recruiting process Ketia said that it wasn’t easy notifying the colleges who spent time building relationships with her recruiting her that she had decided not to go to their school. They may have been good programs, just not for her. When Ketia arrived at UConn, the transition from high school to college was hard. She found there to be a big gap between high school and college regarding the level of competition. Ketia worked very hard each year, continuing to get better, maintaining a positive attitude. Ketia believes the current UConn team will be great this coming season.